Proponents of raising the minimum wage say it would move more Nebraska families from poverty to self-sufficiency. (Watchdog.org) Lincoln, NE – Having failed to persuade state lawmakers to increase the minimum wage in Nebraska, the senator who introduced the bill said he’s working with advocates who are considering trying to get the issue on the ballot in November. A bill introduced by State Senator Jeremy Nordquist (D-Omaha) fell five votes short of the 25 votes needed to clear the first round of debate last week. It would have increased the minimum wage from $7.25 to $9 an hour over three years. During a conference call today he said he’s working with excited allies who are considering moving forward with a ballot initiative in November. 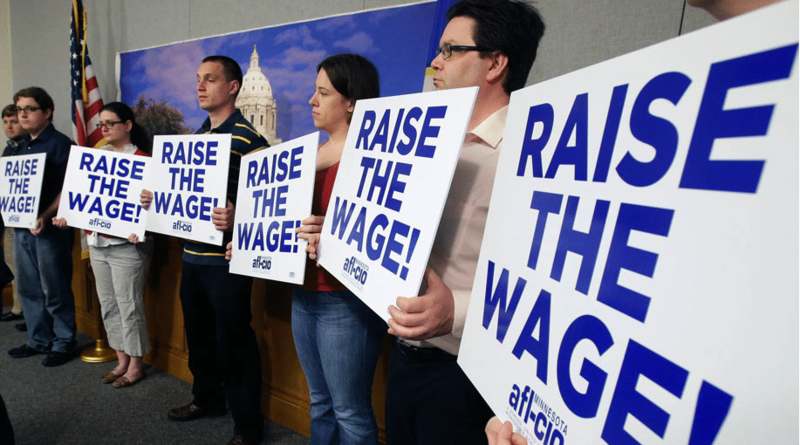 If Nebraska supporters decide to take the issue to the ballot, they would join four other states with Republican-controlled legislatures that will consider increasing the wage via ballot measures — Alaska, Michigan, South Dakota and Arkansas. Nebraska’s minimum wage hasn’t increased since 2009, and 21 states and the District of Columbia have a higher minimum wage than the federal requirement of $7.25 an hour. Democrats have pushed the issue in at least half the states this year, according to the Associated Press. Nordquist has argued Nebraska’s middle class is shrinking, median household income is declining and the state needs to move families from poverty to self-sufficiency. While Nebraska consistently has one of the lowest unemployment rates in the nation, he said 18 percent of children live in poverty. A higher rate also reduces turnover and increases productivity, he argues. Although Nebraska lawmakers who opposed the rate increase said virtually nothing during the debate on the floor last week — knowing they had the numbers on their side — opponents say increasing the wage could cost jobs, increase consumer costs and require small businesses to cut jobs or close.